The pharmaceutical industry needs a shot in the arm - and not a moment too soon. The executive suite is mired in a bygone era, a time when extensive, well-funded pharmaceutical R&D produced blockbuster drugs, kept everything in-house and reaped the financial rewards. But that way of working needs to change. Executives now need to know what the technologists in their companies are doing in order to survive the next decade. Written for those new to industry, as well as for experienced professionals or specialists looking to expand their knowledge, this book is a must-read for business executives and information technologists alike. Pharma's Prescription bridges the knowledge gap between current business practices and the most valuable technologies today. 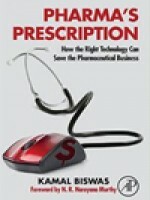 This book is filled with practical, real-life examples from industry and is a straightforward guide for all pharmaceutical and information technology executives who need to improve their businesses.